200 pages | 40 B/W Illus. Why self-regulation? With the advent of such concepts as design for the environment, industrial ecology, and the recognized enlightened self-interest that voluntary compliance brings, it is in any company's best interest to avoid fines, liabilities, and bad publicity. Consumer concern and pressure from the marketplace give a competitive advantage to companies that pursue self-regulatory initiatives such as ISO 14001. Bottom line, voluntary compliance saves your organization time and money. Written by a senior environmental manager at a Fortune 500 company, Industry Self-Regulation and Voluntary Environmental Compliance examines environmental regulation through a review of compliance and enforcement theory. Case studies of four leading programs illustrate the use of self-regulation as a compliance tool. The author highlights industry best practices, identifies the key elements of a successful self-regulation program and focuses on the benefits. Today's political environment has shown that to be successful environmental policy must move to the next level, one in which we take advantage of voluntary self-regulation initiatives and focus on environmental improvement. Industry Self-Regulation and Voluntary Environmental Compliance shows you how to create a voluntary self-regulation program that will result in your organization becoming a star company. "Industry Self-Regulation and Voluntary Environmental Compliance provides a useful introduction for students seeking to understand a range of innovative environmental programs." "… admirably clear and well organized, presents thoughtful, easily-understood discussions of relevant programs such as Responsible Care, StarTrack, and voluntary industry initiatives, and includes helpful case studies. Our students benefited from the many useful examples and summary points - a book that is a real aid to learning about an important emerging area of environmental responsibility." 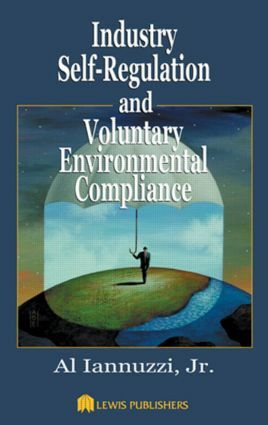 "Dr. Iannuzzi's book provides a succinct and well-informed overview and analysis of self-regulation and voluntary compliance that will be of great benefit to environmental regulators, planners, and managers. His in-depth case studies illuminate the challenges and opportunities faced by industry and government as we search for ways to achieve a sustainable economy without sacrificing prosperity. He presents a detailed model for a cooperative process of self-regulation that recognizes the input of all stakeholders, including business, government, environmental groups, and local communities. … a timely and important book." "This book makes a compelling case to proceed with self-regulation. It offers thorough analyses of some of the opportunities and the pitfalls. And it is a compelling read for such a serious topic." "As academic programs in environmental management and environmental engineering are revised and expanded to incorporate changes in the industrial and regulatory communities, understanding of voluntary compliance has become increasingly important. This book provides a comprehensive survey of voluntary approaches to regulatory compliance by industry. The comparison of programs related to environmental regulation in contrast to OSHA regulations is informative. The sections on theory of self-regulation and the case studies of actual industrial self-regulation programs are most useful in teaching and these issues are explained in an easily understood and comprehensive way to students. This book illuminates classroom discussion and will provide value to students who become involved in regulatory process on either side of the equation."